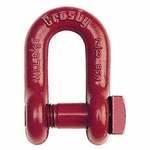 Load-rated trawling chain shackles are used for various applications, such as on trawl doors, the rigging of nets and areas where critical loads are applied. Shackle bodies are made from forged steel, Quenched and Tempered, same as the popular G-209 and G-2130 shackles. Bolts are made from heat-treated alloy steel. Safety factor of 4:1.